Burning hillside in Yanardagh outside Baku. Photo: Blair. Today, we usually think of fire as being dangerous. Parents warn their children, "Don't play with matches." We install smoke detectors in buildings to detect the first signs of smoke or heat. Shouting "Fire!" makes people panic and run away. There's even an occupation for people who put out fires. Ancient peoples thought about fire differently. They valued it for light, warmth, comfort and safety. Cave dwellers gathered around stone hearths to protect themselves from the cold, to cook their food and to scare away wild animals. Because fire was essential for survival, the ancient Azerbaijanis had the highest respect for it. They considered it as life-giver and protector. Zoroastrianism, a religion based on the worship of fire, was once practiced in Azerbaijan before the Arabs invaded the land in the 7th century and forced everyone to accept the Islamic religion. In fact, you can still find a fire-worshipper's temple not far from Baku. In Zoroastrianism, the human breath was thought to be unclean. Priests serving at these temples used to put a cloth over their mouth and nose so that they wouldn't breath on the fire which they considered sacred. Even though this religion is no longer practiced in Azerbaijan, some people in certain regions still practice the custom of never blowing out a fire or extinguishing the flames in their oil lamps. 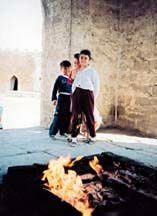 Children at Fire Worshipper's Temple, now a Museum, outside Baku. Photo: Petra Plukkel. In Azerbaijan, there are many customs and legends related to fire. Fire is associated with success so there are several blessings and curses related to it. If people say, "May you never lack fire," that means they wish you a comfortable life. If they want to curse you, they may say, "May your fire be quenched forever." Fire has been used in Azeri weddings from ancient times to symbolize a wish for the health and comfort of the newlyweds. Some of these traditions are still practiced today in the countryside. Sometimes, when a bride leaves her father's home, she walks around a fire three times and then she takes a lamp lit in her father's home and carries it to the new home where she will live with her husband. Probably the most striking fire-related customs occur during the spring celebration called Noruz (March 20-21). This Festival, celebrating the first day of Spring, dates back to the Zoroastrian religion. On the Wednesday before Noruz, boys build bonfires in the streets and fields and leap over the flames. They have to watch out not to fall in the fire and get burned. Tradition says that by jumping over the fire, the goodness of the New Year will come and the bad things of the past year will go away. People often wear red clothing at Noruz and decorate their homes in red. In Azerbaijan, it's possible to visit places where the land is actually "on fire." In this region where so much oil is buried deep in the ground, gas emissions seep to the surface of the earth and catch fire. There are many stories about mountains and hillsides associated with such fires. For instance, there's a legend about Yanardagh (pronounced yah-NAR-dag) which means "Burning Mountain." People say that the fire coming out of the mountain rose from a young man deeply in love. At Chiraglidagh (chee-RAHG-lee-dag) which means "Mountain with Light" near Gobustan, a brave young man turned into a burning fire so he could rescue 40 young women. Another story associated with this place says that the flames on the mountain protected the people living in a village nearby. When enemies tried to attack at night, the people didn't know what to do. An old man prayed to God, asking Him to show them a way to escape. Soon afterwards, a light began to shine out of the mountain rocks nearby. The people followed that path and climbed over the mountain to the other side. When their enemies tried to chase them, the light turned into a flaming fire and blocked their path. The legend of Yanarsu (yah-NAR-su) which means "Burning Water" is about a mother who couldn't find her lost son though she wandered all over the plains of Mughan. Exhausted, she sat down and cried so much that her tears formed a small river. Legend says that she herself was turned into a tree that rooted itself there by the edge of the river. A few years later, the grief from the mother's heart caused the river to catch fire. The local people say that they have seen the flames shimmering on the river at night. Some people believe that sick people will be cured if they see these flames. Not far from Baku on the Absheron Peninsula between the villages of Mahammadli and Diguah, there's a hillside on fire. It always is on fire, even the rains don't quench the flames. This fire has been burning for as long as anyone can remember. There's a restaurant nearby and if you go there at nighttime, you'll see a spectacular sight - one that's hard to forget. The dancing flames aren't much higher than two or three feet tall, yet like any gas-fed fire, they throw off a tremendous heat, making it impossible to stand very close by. Places like these are exactly the reason why ancient travelers called Azerbaijan "the Land of Fire." Maharram Gasimli is Deputy Director of the Nizami Institute of Literature at Azerbaijan's Academy of Sciences. Jean Patterson also contributed to this article.